Midi-Loop of Death when having Plugin and Hardware controlling each other? So I have a Roland TR-8S drum machine and got a VST plugin to control it. What I would like to achieve is to be able to control the drum machine with the VST plugin so I can for example automate it. But I would also like to work on the machine and record whatever I do on the hardware as an automation. This goes on until (I guess) Ableton finds out that there's something wrong and stops this loop. Therefore, when I move anything too fast on the machine, CPU goes up to 200% for a short moment, causing drop outs or even crashes. 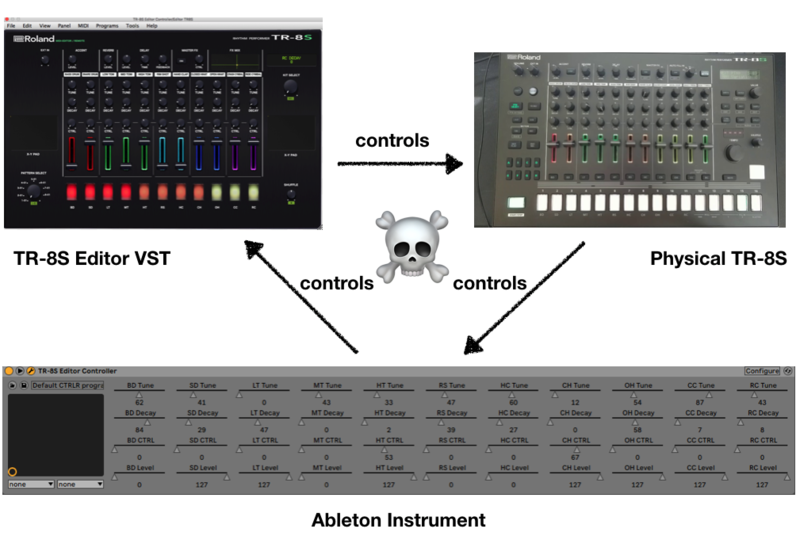 Re: Midi-Loop of Death when having Plugin and Hardware controlling each other? Maybe (just maybe, I don't have much experience with hardware) disabling "Track" in the corresponding MIDI Input and leaving only "Remote" On works? Does that plugin editor even need MIDI out? If you can turn off the MIDI out it would solve it too, obviously. u can turn off the MIDI out it would solve it too, obviously. Plugin hardware synth editors usually - as in I can't think of one that doesn't - use MIDI to communicate with the synth, so MIDI out (and usually in) is required. From what you say it does sound like you might have a MIDI feedback loop going on. MIDI loops do result in chaos very quickly. To prevent it you probably need to prevent the editor and MIDI tracks echoing control movements on the TR back to the TR. If a synth sends MIDI and the DAW is set to monitor that MIDI and send it back to the synth you get multiple responses to every MIDI message. If the hardware involves a sequencer which sends MIDI things can get messy very quickly. There's a few ways way to handle this, and it may mean combining several of them depending on exactly what you are trying to do. These are general ways to handle MIDI, DAWs and hardware synths. I don't have a TR so can't test things myself. If the editor can be set to not echo MIDI back set it not too. Unless you need the MIDI track feeding the synth to echo back the MIDI the TR is generating set the track monitoring pull-down to anything other than "in". That way MIDI in the track gets sent to the synth, MIDI from the editor (which usually lives in an audio track) also gets sent to the synth, but the MIDI generated by the synth doesn't get echoed back to it causing a loop. You can record the MIDI from the synth so long as you don't set the MIDI track monitoring to "on". Another approach is to set the hardware synth to "local control off" if it allows that. Then set a MIDI track in Live to connect to the synth and switch the track MIDI monitor setting to "on". What then happens is the synth no longer responds directly to it's controls being operated. Instead it sends the MIDI to the DAW, the DAW echoes it back and the synth then responds to the echoed MIDI. You wouldn't have to do anything if the VST was properly designed. Whoever makes that plugin really screwed up if changes on the hardware are not mirrored in the plugin. That is the whole point of using a plugin like that.